What do you get when you combine a microwave and a drill? Awesome. Even if the closest you get to tools is ordering a screwdriver at the bar every once in a while, it's okay if you really really want a Microwave Drill. Rather than using conventional drill bits, this mean machine—dreamed up by a pair of researches at Tel Aviv University—harnesses the power of microwaves to bore holes in concrete and ceramic like butter . 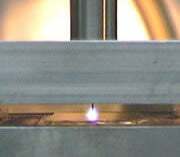 The drill works by heating the material up to 2000°C and then pushing a rod through. It can drill holes between 1mm and 1cm in diameter and can drill through glass without shattering it. Even better, they're aiming to make these suckers cheaper than their laser drill competition and available within a few years. In a word? Drilltastic .